So there I was grumbling to myself for most of the first 6 innings. The Bulls had wasted a one-out triple by Kyle Roller through awkward baserunning by Roller himself and a caught stealing of Dayron Varona. Starting pitcher Justin Marks was really working hard (he ended the game having thrown 103 pitches in just 3 ⅔ innings). And then in the 6th inning, after a leadoff home run by recently-returned Jake Goebbert, the Bulls left the bases loaded. Meanwhile, back in the 4th the RailRiders had put up three runs. 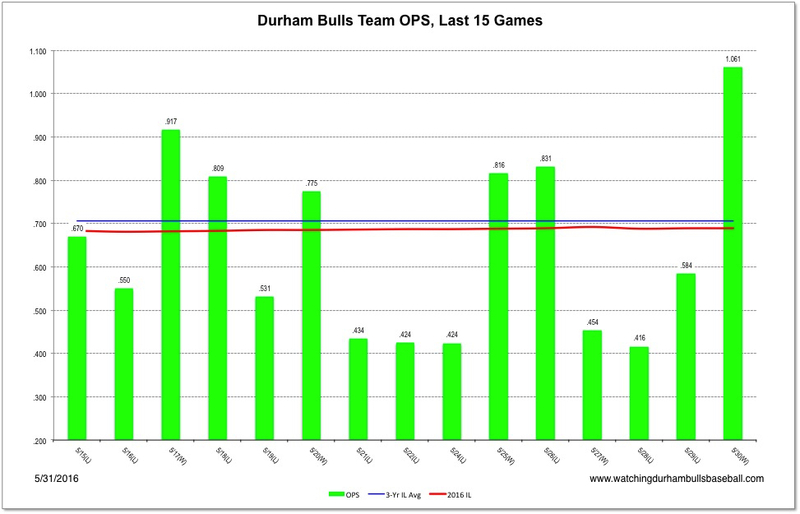 But then came the 7th as the Bulls got a run off a Jaff Decker sacrifice fly and then the 8th when the Bulls put finishing touches on their best hitting game this year, a one game OPS of 1.061 (see chart below)! A solo home run by Nick Franklin and a two-run homer by Dayron Varona were the innings’ highlights. Meanwhile the bullpen crew of Markel, Wagner, Farquhar, and Floro, threw 5 innings of shutout ball, closing down one of the best hitting teams in the International League. As mentioned, Jake Goebbert passed through waivers and is back with the team. Patrick Leonard got sent to the Montgomery Biscuits. Leonard played in 42 games so far this year as a 1st baseman, 3rd baseman, and outfielder. He was hitting just .198, well-below his last year’s performance with the Biscuits. Probably part of larger roster shuffling. Stats. Johnny Field got promoted from Montgomery. Looks to be a pure outfielder and it looks like the 24 year-old has been having a pretty good year so far. Stats. Cameron Seitzer, who has been with the Bulls all year, has been sent to “Extended Spring Training” (probably a paper move). The first baseman is not having a particularly good year with an OPS of just .464. Stats. Early in the game new guy Johnny Field was coaching first base, which got me to wondering, just what is it that hitting coach does during a game? We see the manager and the pitching coach pretty regularly, but not Ozzie Timmons. But then he suddenly showed up, coaching first base. The first time I’ve noticed him there this year. Have I been missing something? Remember Ryan Garton, who made 14 appearances for the Bulls before being called up a few days ago? Turns out he’s part of a new training experiment that the Rays are experimenting with, but also being very close-mouthed about. Something about varying the weights of balls thrown in training. Story here. Dylan Floro got his third save in his third opportunity last night. Has he found his niche? Here’s that chart I mentioned earlier. Game-by-game OPS scores for the last 15 games. Last night was the best this year. Timmons coaches first on occasion. He's also the replacement manager if Sandberg gets tossed. I'd guess during the game he's talking strategy as well. That would be my guess as well. And I saw him have a chat with a fan last night, maybe someone who'd seen him play in majors. But since he so rarely coaches 1B I just don't see him around as much. I guess you heard that Sandberg got tossed for being out of the coach's box while on the road. First I've ever hear of that rule being enforced. Yeah that was a bizarre toss. I realize they were warned with Acosta being out of the box earlier, but still. It almost seems like the other manager (sorry forget who we were playing) was asking for it for whatever reason. Haven't been to many games this year, but going tonight, so hopefully "Good Snell" shows up.